Life isn’t like a box of chocolates. It’s more like a jar of jalapenos. kurt asked if i wanted to be a runner (someone who delivers food to tables). so i broke my 20 day not-ordering-out streak with a veggie gyro from dimitri’s. boy was it worth it. we had an impromptu vacation with some friends on saturday night. the house is inhabited til december while some work gets done, and while the occupants work on retiring. it was really nice.. the dogs had an awesome time running around and we sat by the fire after playing a friendly game of euchre. i stayed up too late, which made me kinda groggy at 7:30 when nora decided it was time to get up. the willy st fair was kinda frustrating as we decided to bring both dogs, and, as it turns out, nora seems to hate crowds. so, getting through all those people to find the falafel stand was a challenge. we had dinner at the magnus to celebrate our 5th annual wedding anniversary. it was absolutely delectable, as always. not ordering dinner! as long as we don’t count the egg drop soup that i threw on kurt’s chinese order last sunday. i’m still paying for lunch, and breakfast on sundays, but other than that i’m doing pretty good with this self-imposed rule. i was going to try to avoid the “six years ago today, i was doing…” post, but kurt’s mom is flying back to madison from nyc today… and i can’t help but think about it until i know she’s safely back in the central time zone. the next few days were substantially quiet. everywhere. people even drove better… nicer. without such a rush. woodman’s was tolerable. “you go ahead of me” was uttered more often. it’s amazing how fast humans shake that. 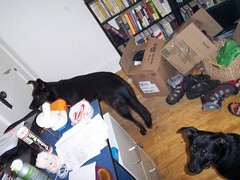 about having two dogs is that jones hasn’t touched the garbage in two weeks. at the apartment, we had to put it out in the back hallway when we left the house, and now, it seems like he just doesn’t care. who knows, though, it could be because we have a house now and he doesn’t want to mess it up? we just kept putting it out into the back porch, for some reason, until Nora came along.